During March 2009, an excavation was conducted in the Shivṯa National Park (Permit No. A-5623; map ref. 16455/53241), to facilitate the reconstruction of a room in a domestic structure and courtyard, Building 121 (Hirschfeld 2003), located next to the entrance of the ancient village. The excavation, undertaken on behalf of the Israel Antiquities Authority and underwritten by the National Nature and Parks Authority (NNPA), was directed by T. Erickson-Gini (field photography), assisted by A. Hajian (surveying), O. Bortnik (NNPA conservator), A. Biton (NNPA park manager), and I. Lidski-Resnikov (drawing of finds). 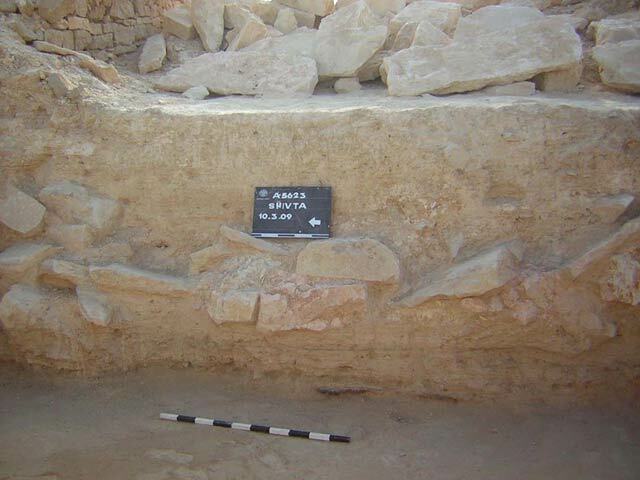 Employees of the NNPA participated in the excavation. Shivṯa (Sobota) is a large ancient town (c. 90 dunams in size; Fig. 1), located in the Negev Highlands. Epigraphic evidence found at the site indicates that it was established by the Nabataeans sometime in the first century CE, probably in the reign of Aretas IV. Excavations at the site were carried out between 1934 and 1938 by H.D. Colt and the expedition team was sponsored by New York University and the British School of Archaeology. Although the Colt Expedition excavated extensive areas of the site, including eighteen domestic structures, no excavation report was published following the destruction of the records by arson during disturbances in 1938. 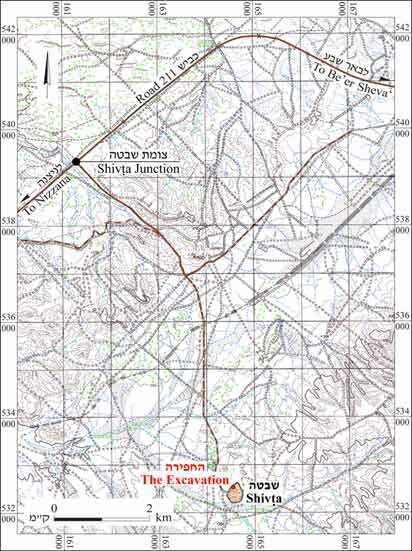 Probes were carried out in domestic structures of the site by A. Segal between 1980 and 1982 (Segal 1983) and in the North Church by S. Margalit and A. Negev between 1985 and 1987 (Margalit 1987). Building 121 is located on the western perimeter of the site. The building includes three or more rooms next to a large, open courtyard (Fig. 2). The western wall of the courtyard makes up part of the perimeter wall. The town was not walled and the exterior walls of abutting domestic and public structures formed a solid enclosure with a number of openings. Building 121 is situated on the north side of one of the main entrances into the town. 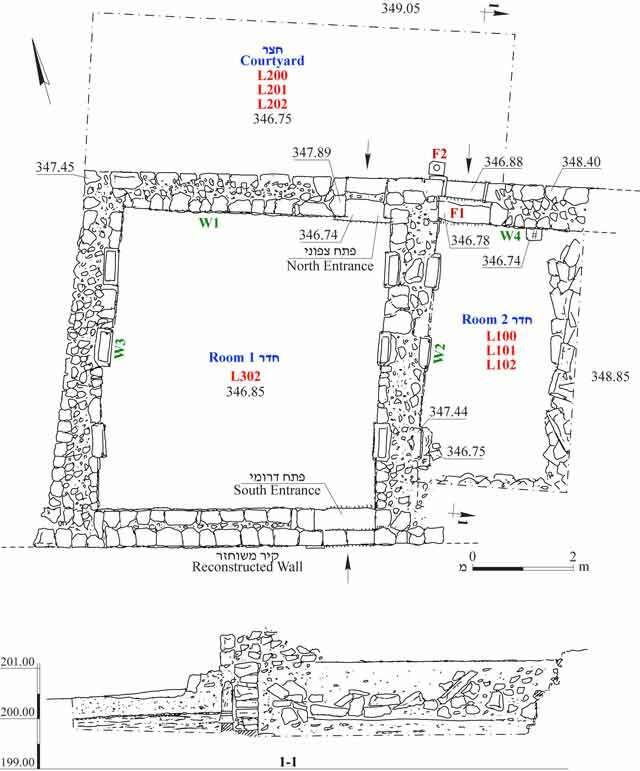 The current excavation in Building 121 was concentrated in the main entrance room of the structure (Room 1), in part of an adjacent room located to the east (Room 2) and in part of the courtyard located north of the rooms (Fig. 3). Both Rooms 1 and 2 opened onto the courtyard along their northern faces. Most of the upper level of Room 1 was apparently excavated by the Colt Expedition. The present excavation was extended down to a stone-paved floor. The excavation revealed that the structure was built and occupied in the Late Byzantine period (fifth–seventh centuries CE) and continued to be occupied as late as the Early Islamic period (eighth century CE). 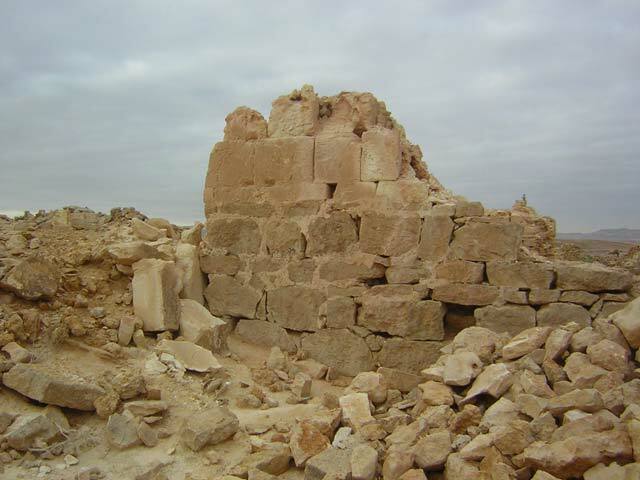 The structure appears to have collapsed sometime after its abandonment, possibly in the Middle Islamic period. The exterior of Building 121 was relatively well-preserved, particularly on the exterior of Room 2 (W4), facing the courtyard. The lower courses are constructed from hard limestone blocks and the upper courses consist of lighter limestone blocks of a superior workmanship (Fig. 4). The exterior of the building facing the street was partially reconstructed over the last few decades. Compared to courtyards in other domestic structures in Shivṯa, the courtyard in Building 121 was large, possibly due to the location of the building along the western perimeter of the town. The interior rooms were originally covered with hard limestone slabs, supported by three arches in each room. Both rooms were paved with small stone tiles over bedrock but most of the floor in Room 2 appears to have been removed in the Early Islamic period. Large stone tesserae were produced in the courtyard immediately outside of Rooms 1 and 2. 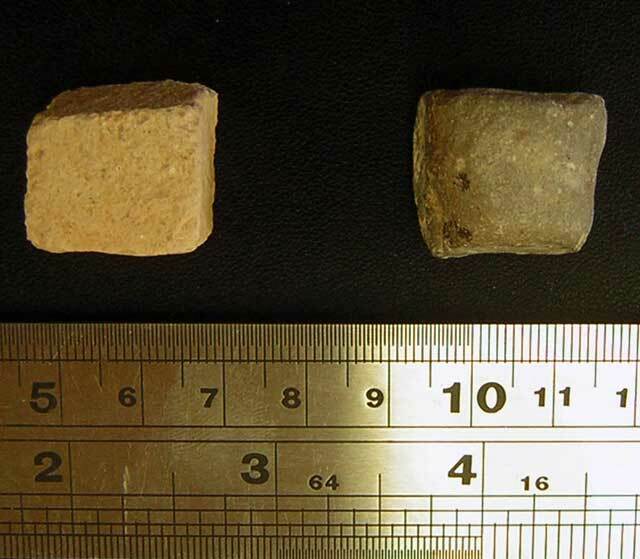 However, no tesserae were used in the excavated rooms. The level of the courtyard rose over time, forcing the residents to place blocks on the lintel of Room 1, to slow the spill of debris from the courtyard inward. Room 1: Although the room (5.3 × 5.7 m) had previously been excavated down to nearly the floor level, the floor itself was found covered with a layer of ash (L302; depth 0.1 m). This was the entrance room into the main structure; it was accessed from the street via an entrance in the south and on the same axis was the exit to the courtyard in the north. The northern exit was paved with a single large, flat stone (width 0.88 m) and the doorway was preserved 1.6 m high. The wall facing the courtyard (W1; length 5.7 m) is preserved two or three courses high along its northern face. After the abandonment of the building, W1 collapsed northward into the courtyard (L200; Fig. 5). Three pilasters of finely worked limestone blocks support arch springers along the eastern wall of the room (W2) and its western wall (W3). The pilasters, preserved three courses high, supported a pedestal and one or more arch stones (Fig. 6). Room 2: The stratigraphy in this room was fully preserved. It shares a wall (W2; width 0.8 m, preserved height 1.5 m) with Room 1 along its western side. Nearly half of the room was excavated down to the bedrock. 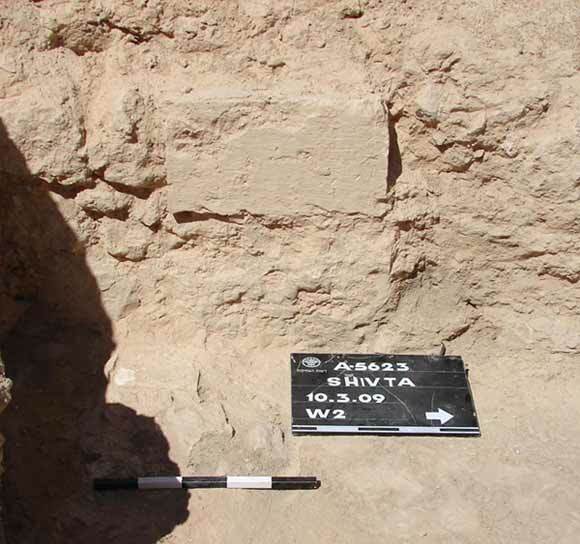 Similar to Room 1, three pilasters, spaced c. 1.1 m apart, were found along the eastern face of W2. Each supported a pedestal and an arch stone (Fig. 7). Debris of the collapsed arches and roof slabs (average size 1.56 × 0.18 × 0.57 m) were discovered in the upper layers of the room (L100, L101). These appear to have collapsed sometime following the abandonment of the structure after the Early Islamic period (Fig. 8). 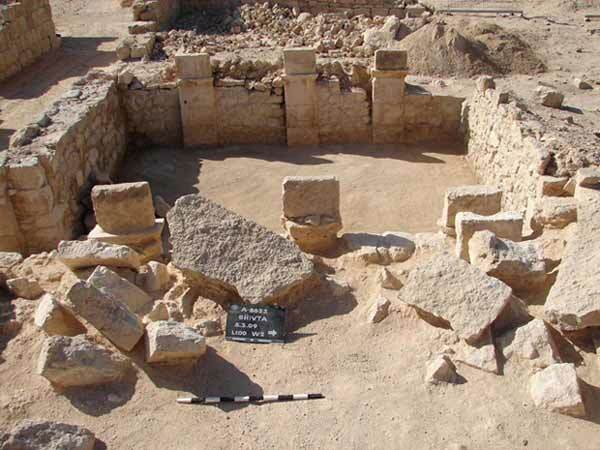 The floor of the room was originally paved with floor tiles (average size 0.22 × 0.20 × 0.03 m) and some remnants of it were discovered near the western and northern walls (Fig. 9). 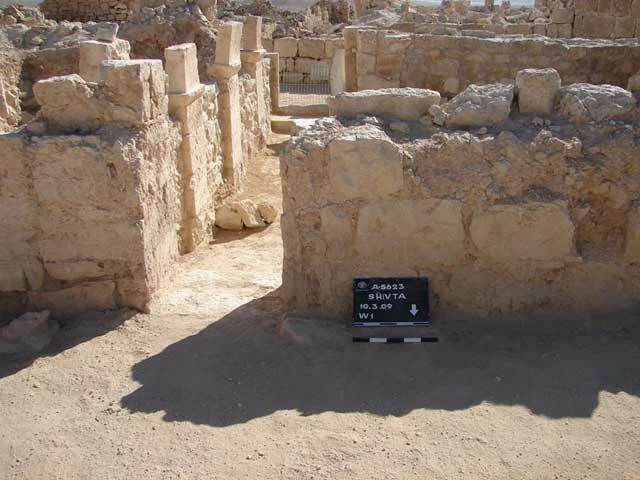 It appears that most of the floor pavement was removed during the Early Islamic occupation. The room was accessed via a doorway (width 0.66 m) in the northern wall of the room (W4). The threshold was decorated with two ‘reversed’ capitals on the side, facing the courtyard. One step was found below the level of the threshold on the interior of the room. Ashy debris (L102) had accumulated on the floor in the room, as it flowed in from the courtyard. During the second phase of occupation in the Early Islamic period, blocks (F1) were placed on the threshold in an attempt to slow this process (Fig. 10). 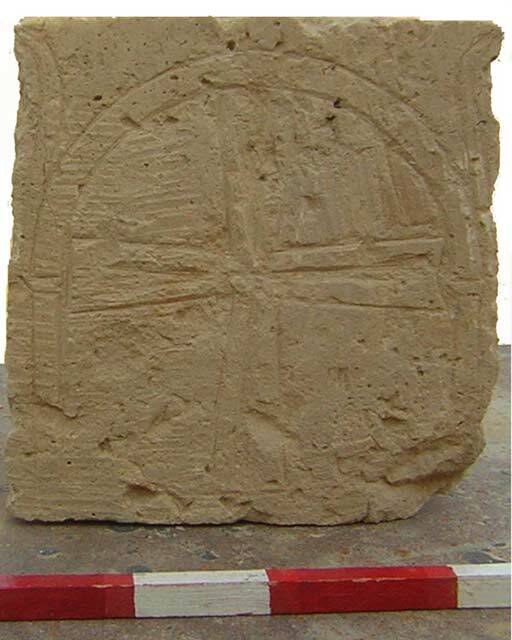 A cross incised on a stone, which may have originally graced the lintel of the doorway, was discovered inside the room near the blocked threshold (Fig. 11). The interior face of the room’s walls was built of medium-sized fieldstones that were originally covered with plaster. Remains of the plaster’s mud-base were visible on the interior of W4. The soil overlying Floor 102 was carefully sifted to find dateable artifacts, but no coins were uncovered. The potsherds found in this layer included jars (Fig. 12:4–6) and a casserole (Fig. 12:8) from the Late Byzantine period, as well as a fine ware cup (Fig. 12:10) and part of a black steatite cooking pot (Fig. 12:11) from the Early Islamic period (eighth century CE). (Fig. 12:9), were uncovered in the level (L202) flush with that of the northern entrance in Room 1. Stone-cutting activities took place in the courtyard near the entrances into Rooms 1 and 2 (L202) during the earliest level of occupation in the Late Byzantine period. 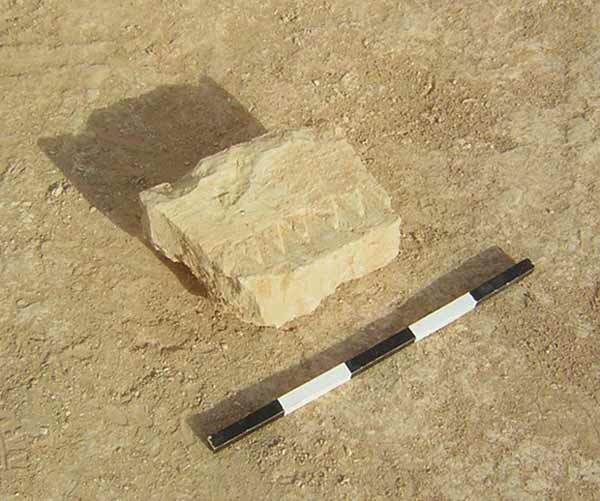 A hard, white stone, used as raw material for the production of tesserae (F2; Fig. 13), was discovered in this area; it was surrounded by randomly deposited large tesserae (0.20 × 0.15 × 0.15 cm; Fig. 14). This type of tesserae has been found elsewhere in the site, including the atrium of the North Church, in a domestic structure abutting the church (Hirschfeld 2003: Building 170) and in the treading floors of winepresses. A single dark-colored tessera was also found in the courtyard. Part of an architectural element decorated with carved chevrons was discovered in the collapse debris of W1 (Fig. 15). 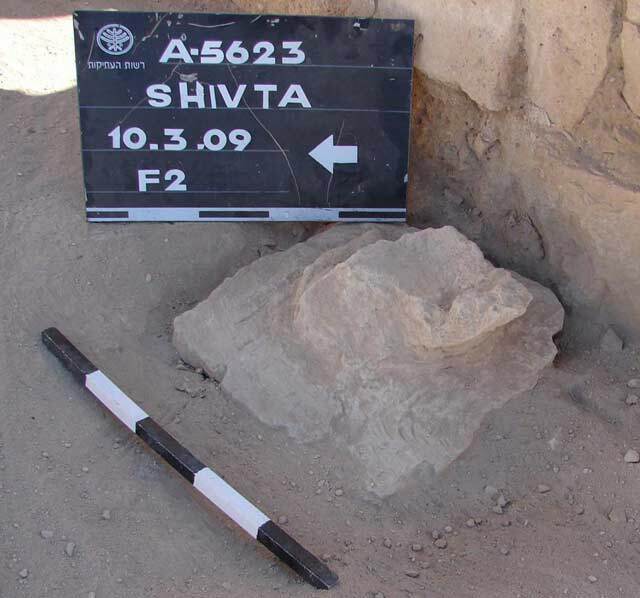 This stone may have been a ‘reversed’ capital of the type used in thresholds throughout the Negev Highlands in the Late Byzantine period, as well as in the threshold of Room 2 (see above). The large amount of ashy soil in the courtyard may have been deposited from braziers and ovens that were commonly used in open courtyards of this type. The level of the courtyard rose above the level of the thresholds of the surrounding rooms in the Early Islamic period (Fig. 16). 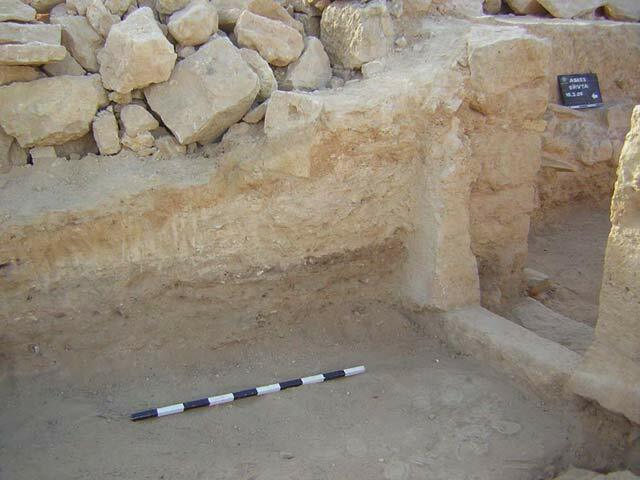 A few months after the end of the excavation, the excavated area of the courtyard was extended downward c. 0.1 m, revealing a rectangular installation (0.24 × 0.46 m), to the west of the northern entrance into Room 1 and abutting W1. The installation was probably used for storing jars or other items; similar examples have been found in other parts of Shivṯa, such as the one located in the street outside the entrance into the ‘Stable House’ (Hirschfeld 2003: Building 90). 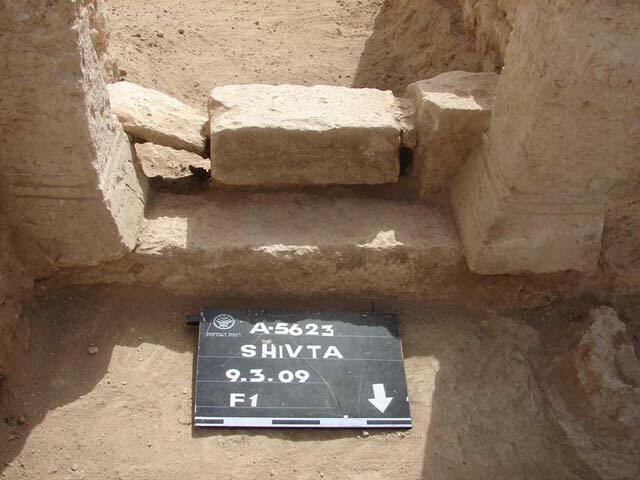 The excavation in Building 121 was a limited probe in the large site of Shivṯa. However, the results of the excavation confirm the commonly-held opinion that the site was expanded in the Late Byzantine period (fifth–seventh centuries CE) and continued to be occupied in the Early Islamic period (eighth century CE). Building 121 may be one of the latest additions to the town in the Late Byzantine period and there is evidence pointing to stone-cutting activities in the courtyard at this time period. Revetment walls present around the North Church and buttressing the western wall of Building 123 (Hirschfeld 2003) are indications that some damage to the site took place in the Late Byzantine period, probably in the early seventh century CE when the neighboring site of ‘Avdat/Oboda was destroyed in a tremendous earthquake. 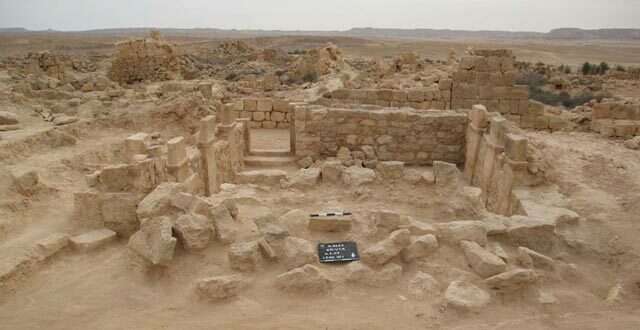 However, the excavation of Building 121 points to a later event, possibly in the Middle Islamic period, which caused the collapse of the ceilings and parts of the walls sometime after the site was abandoned at the end of the Early Islamic period. The original Late Byzantine building was well-constructed and maintained, an indication of the higher standards of living in that period as compared to the later occupation of the Early Islamic period. This reflects the prosperous agrarian economy in the immediate region where wine was produced and exported, as well as the role Shivṯa played in the pilgrimage of Christians making their way to and from Santa Katarina in the Sinai. In wake of the Islamic invasion, the town and the surrounding region were not abandoned, but significant economic and political changes took place, transforming the character of the site in its latest phase of occupation during the eighth–ninth centuries CE. Hirschfeld Y. 2003. Man and society in Byzantine Shivta. Qadmoniot 125:2–17 (Hebrew). Margalit S. 1987. The North Church: The discovery of the First Church. PEQ 119:143–164. Segal A. 1983. 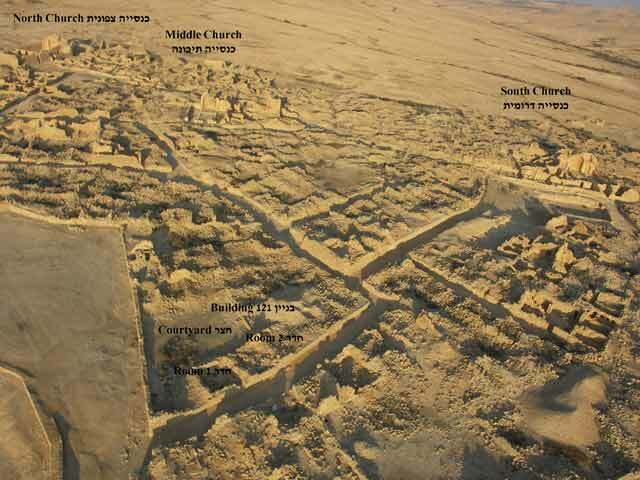 The Byzantine City of Shivta (Esbeta), Negev Desert, Israel (BAR Int. S. 179). Oxford. 2. Aerial photo of Building 121 and surrounding area. 3. 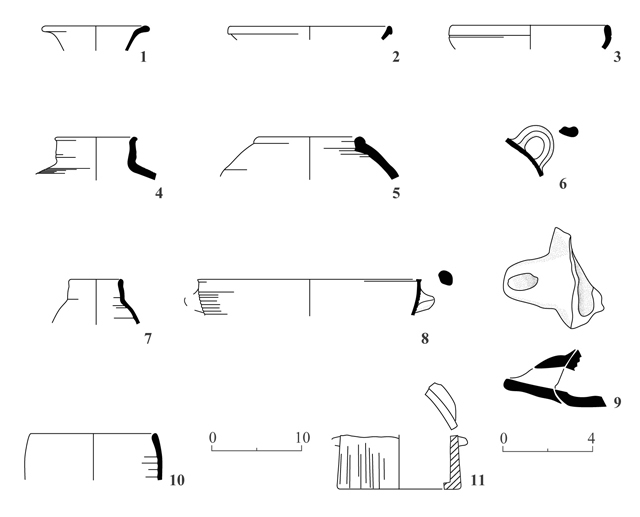 Building 121, plan and section of the 2009 excavation. 4. The northern wall (W4) of Room 2, looking east. 5. Collapse of W1 in the courtyard, looking southwest. 6. Room 1, northern entrance in W1 and pilasters along W2, looking south. 7. Room 2, collapsed arches and ceiling slabs along W2, looking west. 10. Room 2, the blocked doorway (F1), looking south. 11. Room 2, part of a decorated lintel. 12. Pottery and stone finds. 13. Stone used as raw material, looking east.